It occurred to me that being back to the A Song of Ice & Fire series may well be the reason that D's Never-ending Socks are still not finished, but I'm going to have to start the ribbing soon as there isn't very much yarn left. This is good news as it means they should actually be finished for the final Next Step Sock Knitalong post tomorrow (when I'll also be reviewing the sock knitting book I've been using and showing off more finished projects from other participants). Selecting one of the characters will bring up a summary of their profile as well as the quotes about them throughout the book which you can link to directly from the list. 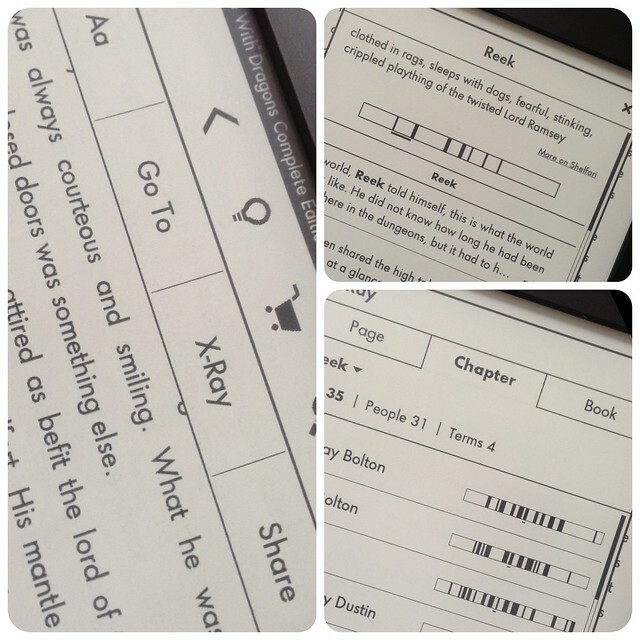 I absolutely love this feature and for this kind of book it is so incredibly useful as many characters are known by different names depending on the point-of-view character for each chapter and 31 people are mentioned in this chapter alone - phew! I really wish I'd had this facility when I was studying English Literature for A-Level. I know that not everyone likes e-readers or the idea of books being replaced with devices and I was firmly in that camp until I started using one. However I can't tell you what a difference it has made to my reading habits and as I said, that's very much to the detriment of D's socks! 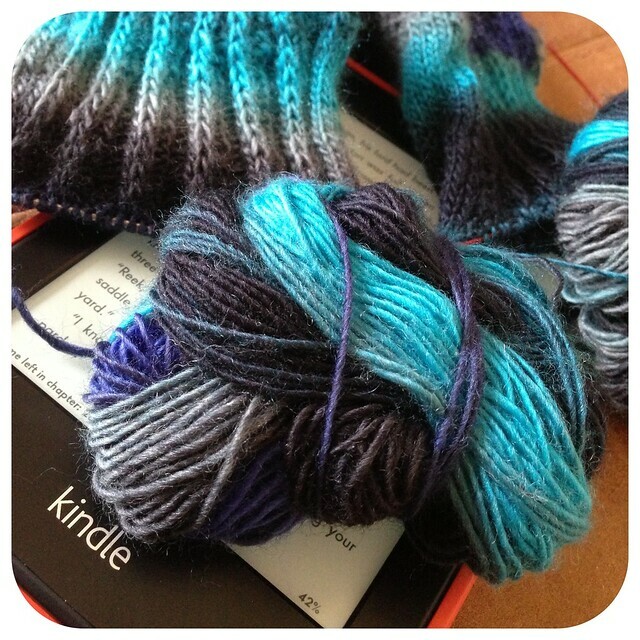 This post is (will be) linked to: WIP Wednesday & Yarn Along (when the link goes live). The main thing I love about my Kindle is how easy it is to hold and read - it reduces reading to just the words entering your eyes, no faffing, page-turning, holding the pages open! I use it most often when I'm knitting as it sits nicely on my knee and just a tap on the button with the side of my hand turns the page when I'm ready to. I read much more than I used to before I had it as I can now read while doing other things, such as knitting or crochet. I have this series but have it in paperback form, some books I just want to hold the book for and my kindle just doesn't do it lol, weird I know ! I do love my kindle though for reading while knitting and feeding the little one so I'm ever so pleased I've put my reading back up there in recent times. The colours of your yarn is absolutely gorgeous, I want some! Thanks for the explanation about the xray feature. I've never used it and didn't know what it did. Like you I thought I wouldn't be a convert but I am. I still read paper books but there's such a great choice on the kindle and it's lighter to carry than a normal book. Ooooh fabulous colourway. I've never heard of the x-ray feature. I have an older Kindle with the keyboard. Maybe it's not available for that version. Either way it's a fabulous thing to have. I've not read the books as yet, I'm quite content with watching the TV series for now. Can't wait till the end of March when it's back on our screens again. The yarn is lovely! Can't wait to see the socks finished. Wow what a great Kindle feature! I'll have to see if my Kindle Fire has that?! One of the reasons I get tired of certain books is that it's so hard to keep up with characters! I used to make a bookmark with names and a few key items to keep track - especially classics with lots of characters! What a useful and neat app.